Our Décolletage Mask features the same premium-grade of bio cellulose used exclusively in our line of facial sheet masks. No mask fabric restores moisture as efficiently or feels as soothing and indulgent as bio cellulose. Admit it. As you get older, the skin on your décolletage (neckline, upper chest, shoulders) has become a bit of a concern. It frequently feels dry. There is freckling and uneven color. And (horror), it is starting to have a crépey texture with (yikes) creases. These highly-visible signs of aging skin are fairly typical. After all, the décolletage is an extremely sensitive skin zone. It has fewer oil-producing glands than facial skin; it also has less elasticity and density. This “thinner skin” gets damaged easily – especially by UV rays – and loses moisture quickly. For most women, care for the décolletage is an afterthought. Bel Mondo Beauty can help. Our Rejuvenating Décolletage Mask is a convenient, spa-quality treatment that thoroughly hydrates this delicate area and transfers nourishing ingredients that improve its texture and tone. We infuse our Décolletage Mask with ingredient superstars like niacinamide, sodium ascorbyl phosphate, alpha arbutin, mandelic acid, and algae extract. With consistent use once or twice weekly, the skin on your décolletage will appear smoother and brighter, and show improvement in tone. Cleanse skin thoroughly, avoiding harsh soaps and body washes. 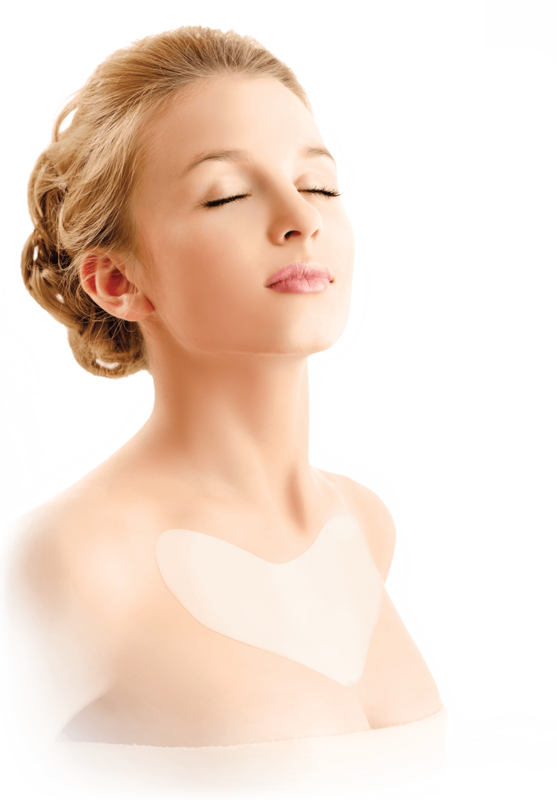 Apply mask (middle layer) to décolletage, smoothing the fabric from middle to edges to assure optimum adhesion. Wear for 15 minutes. If ingredients remain, massage in gently. Always safeguard décolletage area with a broad spectrum sunscreen.